• Up to 20,000 labels output per day for heavyduty labeling demands. • 203dpi low resolutive model available. • 32-bit CPU, LCD display, up to 6ips printing speed,and enlarged memories. • Adjustable reflective and transmission double sensor system ensures precise label detection to meet versatile media demands. • Centronics parallel and RS-232 interfaces available for versatility applications, and PS/2 interface for standalone operation: directly connecting a PC keyboard to input label data without a PC. • Industrial-strength media management: 360M ribbon wax & 8” media compartment. • An external switch sets the printer for use with either inside or outside coated ribbons. • Durable and easy maintenance : easy-to-replace cutter and peeler. • Full range of options :Cutter, Peeler,Font card, RTC. • Printer Server external for Wireless/Bluetooth options. 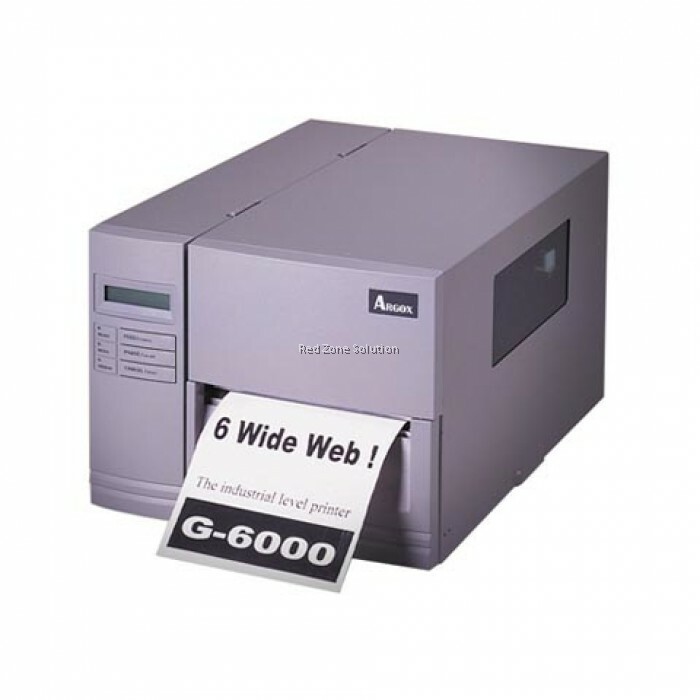 The G-6000 offers the industrial standard 6 inch width to give you high speed performance and greater extension of the printing area. Built-in LCD display, 2 MB flash memory, PS/2 interface for your PC keyboard provides the essential structure for Plug and Play stand-alone operation. Perfectly designed metal case resists rough treatment, heat, and dust, and ensures continuous quality operation, even in the most demanding environments. Superior historical control enhances high printing quality, and is perfect for printing of barcode and small alphanumerics. The G-6000 is simple to operate and it is easy for the user to perform adjustments and maintenance.